Do you teach your kids about saving money? 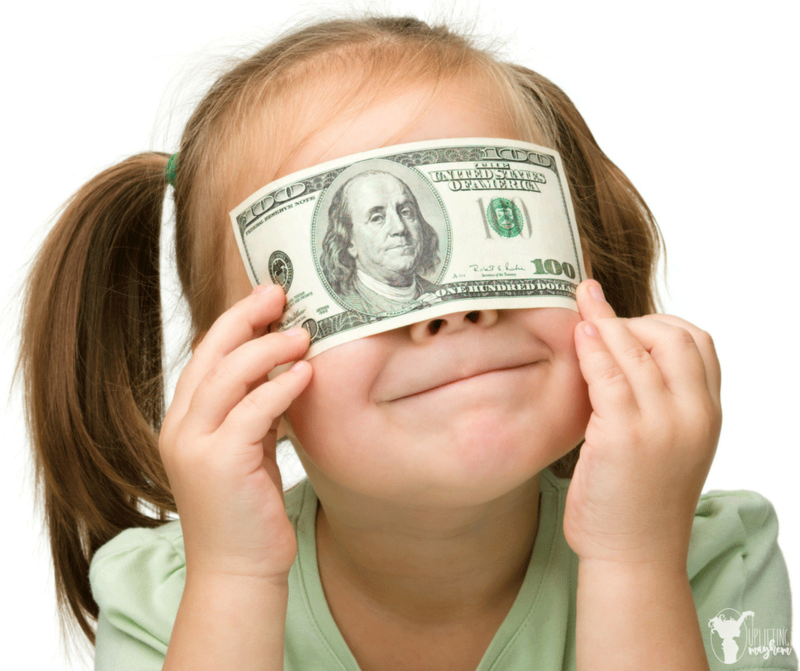 Do you want your kid to be money smart? 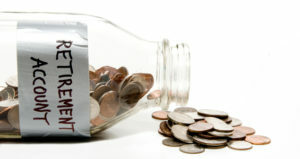 We’ve all heard the saying, “A penny saved is a penny earned.” But how many of us have actually taken that literally? Well … we have. In our home, we save every penny. Of course, it takes a long time for those pennies to add up to, but that’s not the point. My son really wants his very own hamster. I told him that he would need to save his money. It would cost about $50. So he started saving his money. But then he saw a really cool fidget spinner at the store. He had exactly $8 saved. So, the hamster idea went out the window and he spent all his money on a dumb little toy. Back to square one. Why did he spend all his money? I know he would rather have a hamster over a fidget spinner. But saving for a hamster takes self-discipline and patience. It was too hard. The good news is, both of those traits can be learned, especially if you start at a young age. That way when your child is an adult, he will buy a $2,000 used car instead of brand new car so he can afford to pay for his college tuition. So, how do teach a child that a penny saved is a penny earned? A retirement piggy bank with money spilling out. There’s lots of different ways to teach your kids money smarts, but we’ve found a great way to help our kids think about the future and saving money at the same time. We call them “Mission Buckets”. In the LDS faith, all 18-year-old male members are encouraged to serve a two-year proselyting mission in locations all over the world. It costs a lot of money but we still want each of our boys to go. So, in an effort to motivate our boys to save for their missions, I bought a large water container (either 3-gallon or 5-gallon). 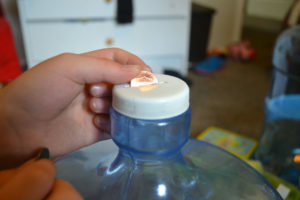 I glued the lid shut and cut a hole through the lid, just large enough to fit a quarter. My son inserting a penny into his “Mission Bucket”. I wrote each of my boys’ names in black marker on their individual buckets. Every couple of weeks, I collect all of my loose change. We gather together and split up the coins. Each of my boys carefully insert their money into their individual buckets. Inevitably, we always talk about going on a mission. Without them even realizing it, they are saving their money and preparing to serve a mission at the same time! What kind of savings bucket will you create to teach your kid to be money smart? There’s lots of future expenses that your kids will face sooner or later: College tuition, new house, wedding, retirement. The list goes on. 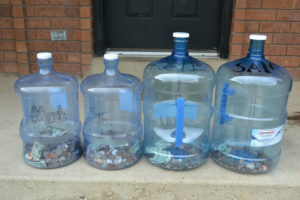 Making a savings bucket for your kids will help them to start thinking about these things now. It’s prepares them mentally as well as monetarily. When we first started our “Mission Buckets” it seemed like it would take forever to fill them up. However, four years later, our boys are starting to see their savings grow. It gives them a sense of pride and accomplishment. All of the sudden, they realize that every penny does make a difference. 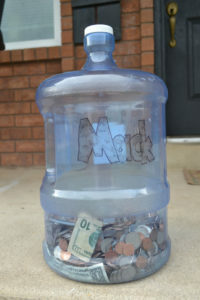 My son’s “Mission Bucket” that he started to fill with coins about four years ago. Of course, a savings bucket won’t teach your child EVERYTHING they need to know about being money smart, it’s a good way to start. If you missed PART 1 of Teaching your kids to be money smart, here is a link for 5 ways to prepare your kids to be smart with their money.